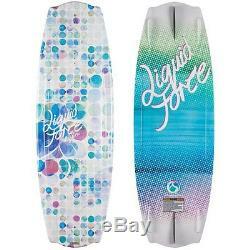 Liquid Force Angel Wakeboard Womens Sz 138cm. If you're looking for fun, you've come to the right place! Liquid Force''s ANGEL wakeboard's Continuous Rocker is super smooth and ultra fluid for easy pop and flawless landings. The ANGEL is no slouch though, as it is highly responsive. It will do what you need with no questions asked! It's designed to help you progress, while putting a smile on your face... Ascend to the heavens with your ANGEL this summer! Aggressive, Continuous Rocker: Smooth, fluid carves with a high arcing pop. D-I-S-C Hull through the Center: Double - Inside - Single - Concave. Softens landings and maintains board speed. Modern Bat Tail: Fuller than the original for more lift off the tail of the board and tucked in tips for quick transitions. Molded-in Warped Long Based Side Fins. Aggressive, Continuous Rocker: Smooth, fluid carves with a high arcing pop - D-I-S-C Hull through the Center: Double - Inside - Single - Concave. Softens landings and maintains board speed - Modern Bat Tail: Fuller than the original for more lift off the tail of the board and tucked in tips for quick transitions - Molded-in Warped Long Based Side Fins - Variable Edge Rail. Any product you return must be in the same condition you received it and in the original packaging. The item "Liquid Force Angel Wakeboard Womens Sz 138cm" is in sale since Wednesday, May 17, 2017. This item is in the category "Sporting Goods\Water Sports\Wakeboarding & Waterskiing\Wakeboards". The seller is "flower1000" and is located in US. This item can be shipped to United States, Canada, United Kingdom, Denmark, Romania, Slovakia, Bulgaria, Czech republic, Finland, Hungary, Latvia, Lithuania, Malta, Estonia, Australia, Greece, Portugal, Cyprus, Slovenia, Japan, China, Sweden, South Korea, Indonesia, Taiwan, South africa, Thailand, Belgium, France, Hong Kong, Ireland, Netherlands, Poland, Spain, Italy, Germany, Austria, Russian federation, Mexico, New Zealand, Philippines, Singapore, Switzerland, Norway, Ukraine, Croatia, Malaysia, Brazil, Chile, Colombia, Costa rica, Panama, Trinidad and tobago, Guatemala, Honduras, Jamaica.